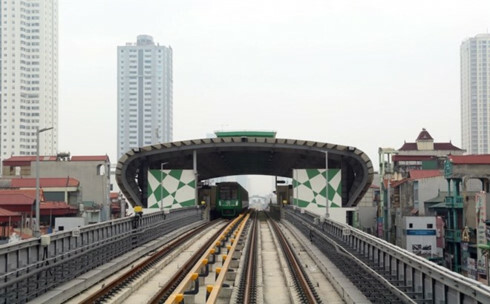 The Cat Linh-Ha Dong elevated railway has been connected to the national power grid since the beginning of July for its trial operation this month. According to the management board of the project, the train has undergone a test run on each section in July before trial on the whole system in August. The railway line stretches over 13km, linking Cat Linh street in Dong Da district in Hanoi downtown with Yen Nghia bus station in Ha Dong district. It includes 12 stations and a depot at Phu Luong ward in Ha Dong district. The railway will operate 13 trains with four carriages each that will run every two minutes at speeds of between 35 and 80 km per hour. All carriages and some 95 percent of equipment have been moved to the construction site while nearly 79 percent of the installation work has been completed so far. Stairs at the stations, depot designs and water drainage systems are being completed. The Ministry of Transport ordered the metro line trial run to start in August, one month earlier than expected to soon put the railway into official operation. The railway has been constructed using official development assistance (ODA) from China with a total investment of 868 million USD. The China Railway Sixth Group is the EPC (Engineering, Procurement and Construction) contractor for the project.